To preview each page, click the arrows at the bottom of the preview. If you don't see the preview, below Presets, select Copies & Pages and check the box next to Show Quick Preview. 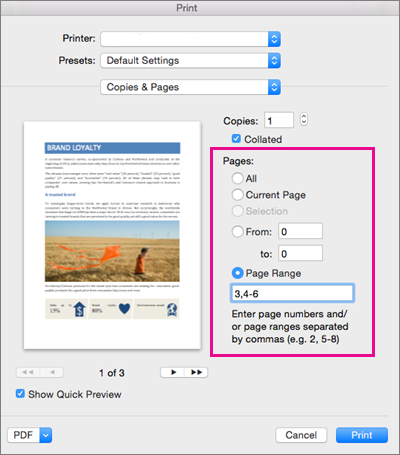 To print the page shown in the Quick Preview, select Current Page. 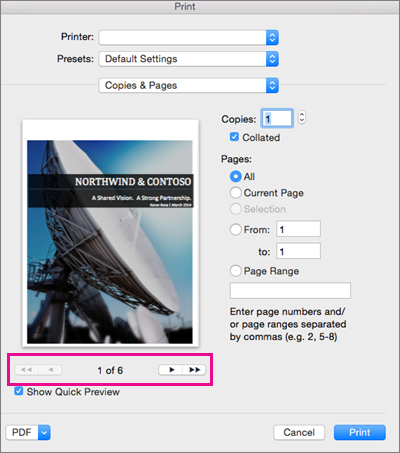 To print consecutive pages like 1 -3, select From and enter the first and last page numbers in the From and To boxes. To print individual pages and a range of pages (like page 3, and pages 4-6) at the same time, select Page Range, and enter the page numbers and ranges separated by commas (e.g. 3, 4-6). Click Copies & Pages, and then click Layout. Click Two-Sided, and then select Long-Edge binding (to flip pages on the long end) or Short-Edge binding (to flip pages on the short end). If your printer doesn't offer automatic duplex printing, you can follow these steps to manually print on both sides of the paper. Click Copies & Pages, and then click Microsoft Word. After the odd pages are printed, flip the stack of pages over, reinsert the stack into the printer, repeat steps 1 and 2, and then click Even pages only. Depending on the printer model, you might have to rotate and reorder the pages to print the other side of the stack. Click Odd pages only or Even pages only. 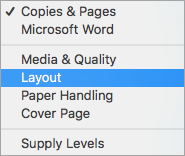 If your printer stacks the output back-to-front, you can still have your pages print in the correct order. Follow these steps to print a document that begins with the last page. Under Print options, select the Reverse print order check box. On the Layout tab, click Orientation, and then click Portrait or Landscape. Important: To change the orientation for a specific section, your document must be divided by section breaks. Learn how to add section breaks. Double-click the section break that follows the section you want to change. Next to Apply to, click This section, and then click OK. Select the options that you want, such as the number of pages or which pages you want to print, and then click Print. Tip: If you don't see other print options in the Print dialog box, click the blue downward facing arrow to the right of the Printer pop-up menu. Type the page numbers with commas between numbers or with a hyphen between the starting and ending numbers in the range. For example, to print pages 2, 4, 5, 6, and 8, type 2,4-6,8. Type an s followed by the section number. For example, to print section 3, type s3. Type an s followed by the section number, type a comma, and then type an s followed by the next section number. For example, to print sections 3 and 5, type s3,s5. Type the range in the following format: p ns n-p ns n, where p is in front of the page number and s is in front of the section number. For example, to print from page 2 in section 3 through page 3 in section 5, type p2s3-p3s5. For example, to print pages 5 through 7 in section 3, type p5s3-p7s3. The easiest way to produce double-sided publications is to print them on a printer that supports duplex printing. You can usually learn whether your printer supports duplex printing either by looking at the information that was included with the printer or by looking at the printer's properties. Some printers offer the option of automatically printing on both sides of a sheet of paper (automatic duplex printing). Other printers provide instructions so that you can manually reinsert pages to print the second side (manual duplex printing). Some printers do not offer duplex printing at all. Tip: If your printer supports duplex printing and you are having trouble printing duplex, on the Copies & Pages pop-up menu, click Layout. Then, on the Two-Sided pop-up menu, make sure that Off is not selected. On the Copies & Pages pop-up menu, click Microsoft Word. After the odd pages are printed, flip the stack of pages over, reinsert the stack into the printer, repeat steps 1 through 3, and then click Even pages only. Under Printing options, select the Reverse print order check box. On the Layout tab, under Page Setup, click Orientation, and then click Portrait or Landscape. Select all the text on the pages that you want to change. Under Orientation, click the orientation that you want, and then click OK.
As necessary, Word inserts section break before and after the text that you selected and changes the orientation for those sections. Note: To change the orientation for all pages after the cursor, instead of selecting text, click in the document to set the cursor position. On the Format menu, click Document, click Page Setup, select the orientation that you want, and then on the Apply to pop-up menu, click This point forward. Important: To change the orientation for a specific section, the document must have section breaks. Double-click the section break that follows the section that you want to change. On the Apply to pop-up menu, click This section, and then click OK.
As necessary, Word inserts section breaks before and after the sections that you selected and changes the orientation for those sections.